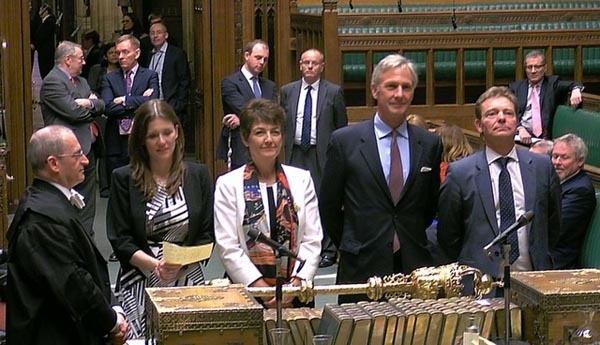 Parliament as an institution last night confirmed its utter degradation when a motley crew of MPs approved the fatuous Cooper Bill, the final vote which concluded the debate standing at 390 to 81. Then, in a craven abnegation of her duties – which will have long-term implications – Mrs May ducked the overdue confrontation with this maverick House and permitted Royal Assent to go through. One of the more perverse features of this stupidity has been removed by the Lords – the requirement for the prime minister to return to the European Council if parliament's date is rejected by the "colleagues" first time round. But the legislation also prevents the prime minister asking for an extension date before 22 May, although this hardly matters if she is asking for 30 June, and is entirely irrelevant if the European Council offers a shorter period or refuses any extension. The whole exercise is not quite the equivalent of fiddling while Rome burns but it is most certainly an exercise in fatuity which will long stand in the record books as an example of what happens when second-rate nonentities take over a legislature after the grown-ups have left town. If this is what happens when parliament "takes control", then we are better off altogether without it. The blunt truth of the matter is that, if this is this failing institution's idea of holding off a no-deal Brexit, it has left it a little late. The MP collective approved in principle Britain's departure without a deal when it ratified the Lisbon Treaty by 346 votes to 206 on 11 March 2008. One wonders how many MPs at the time had read Article 50, but if they had rooted objections to the system proposed, then was the time to do something about it. However, with the Cooper Bill now in force, bearing the somewhat cumbersome title of the European Union Withdrawal (No.5) Act 2019, a motion is to be debated by the House today, with the idea of packing Mrs May off to Brussels with – in all probability – the very date she has already proposed. Needless to say, the effort will be entirely wasted. Mrs May has already passed the political initiative to the European Union and, notwithstanding her visit to Berlin to see Angela Merkel, it is the European Council which will decide on how long the extension will be, if indeed there is to be one. MPs might have better employed their time going into the lobbies to ratify the Withdrawal Agreement – the one certain action within their power that would guarantee that we left the EU in an orderly fashion, ready to negotiate the long-term relationship. But such a simple solution is clearly way beyond the capabilities of the collective, which prefers to fritter away its time (and our money) on its narcissistic displacement activity, rather than do anything useful. Extending its proclivity for time-wasting into an art form, senior members of the Labour party met government representatives yesterday to continue their futile discussion on whether Mrs May is so desperate for Labour Party support that she needs to concede their "customs union" demand, supposedly as a means of ensuring "frictionless" trade. Spreading the contagion – and thereby demonstrating that there is no idea so crass that the legacy media will not wholeheartedly embrace it - we saw Simon Jenkins in the Guardian assert that the "majority deal" now in full view would mean the UK leaving the EU with a customs union in place, which "would keep in place frictionless trade with Europe". To give him his due, Jenkins later amended his piece, with the wobbly but rather less crass claim that the deal would "provide continuity in trade with Europe" – which is hardly the case. This, the paper added, was to "acknowledge that a customs union is not free of friction". The Jenkins epiphany, however, did not stop Polly Toynbee from making the case that the need for a customs union was such that "it's either frictionless trade that forbids the UK striking outside deals, or it's nothing". The main vehicle which May and Corbyn will use to avoid a long extension is some kind of agreement around leaving the EU with a customs union. To be clear: exiting the EU on customs union terms alone is no soft Brexit. It does not guarantee frictionless trade between the UK and EU and therefore does not resolve the Irish border issue; a customs union mainly covers trade in goods and not services which makes up 80 percent of the UK's economy; and it would mean missing out on the benefits of the single market with its suite of employment, environmental and consumer protections. If you discount the polemics on employment, environmental and consumer "protections", this is getting close to a demonstration of sentience. Coming from an MP, this is quite remarkable. The trouble is that we've been suffering from terminological inexactitude for so long that the average hack has ceased to be able to tell the difference between right and wrong, much less the feeble-brained MPs. And it isn't only the politico-media nexus at fault. As Lost Leonardo reminded us yesterday, the so-called experts need to take their share of the blame. Back in July 2017 we had the Cambridge University professor of European Union law, Dr Lorand Bartels, grandly telling us that: "The whole point of being in a customs union is to have completely frictionless trade. Customs unions are essentially what you do in order to get rid of customs border posts". This clearly is not the case but what was so remarkable about this episode was Bartels's hostile reaction to being corrected. We were eventually told that it was our fault for misunderstanding the great man. When he wrote: "The customs union is essentially what you do in order to get rid of customs border posts", we should have known that he actually meant: in order to get rid of them, it is necessary to have a customs union, but not sufficient - not that he actually said this at any time. To this day, academic hubris continues, with Dr Anna Jerzewska recently writing for UK in a Changing EU what they described as a "great new explainer on the customs union". When this included the somewhat dubious claim that, "Goods can move freely within a customs union provided that they have been either produced or customs cleared (with duties paid) in one of the member countries...", I asked if that is the case, why did the EEC/EU need the Single Market? Typically in such cases, my query was ignored. Some drive-by commenters coming on to this blog have been rather aggressive in demanding to know why I have blocked so many of such people on Twitter, and especially the claque of "trade wonks" who insist on acquainting us with their expertise. Expertise on trade, however, does not confer any great understanding of the European Union. Those who approach the EU from the standpoint of it being a trading organisation consistently get it wrong. As any detailed knowledge of the history of the Union will tell you, it is first and foremost a political body. Its focus on trade was, since its inception, a means to an end, the end being the United States of Europe. Trade was, in fact, a second choice, considered alongside Euratom which could easily have been the front-runner. And before that, Monnet had designs on a European Army, with the establishment of a European Political Authority – complete with constitution – to control it. In the talks leading to the creation of the Treaty of Rome in 1957, after the European Army venture had failed, the UK was mooting an intergovernmental trade agreement – from which eventually stemmed Efta. Monnet, Spaak and colleagues, however, deliberately opted for the customs union model. Aware of the role of the zollverein in the unification of Germany, they saw this as the ideal instrument for the political unification of Europe, legitimising the creation of the supranational authority which was to become the European Commission – the embryonic government of Europe. Any discussion of the EU and customs unions without acknowledging the intrinsically political role of both is to head off down the path of misunderstanding. Small wonder, Barnier is ready to negotiate a customs union with the UK. This keeps us, so to speak, in the family, in the same way that Turkey has used a customs union as a pre-accession instrument. Those who dispute the unarguable historical precedents are quite simply wrong, and, where they seek to exclude the political dimensions of trading with the EU, dialogue is pointless. Their ill-informed clatter simply adds to the noise. I have always maintained that, more so than in virtually any other case, the European Union is a slave of its history. If you do not have a deep appreciation of that history, you will never understand the EU – much less the implication of a customs union relationship with the EU. Sadly, many specialists, be it in law, trade or whatever, have only a slender grip of that history. Drop them in at the deep end and, like Polly Toynbee, all they will be doing is competing in the stupidity stakes.